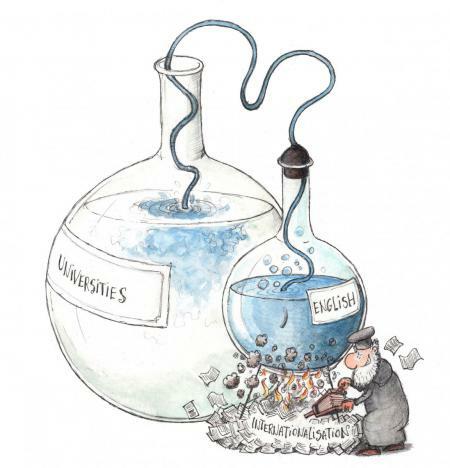 In universities on both sides of our linguistic border, English has been making steady progress in recent years. In many fields, all publications are in English, and in the others, researchers are strongly encouraged to publish in English. A growing number of study programmes are offered partially or exclusively in English. More and more academic vacancies are advertised in English and more and more selection committees meet in English. In several universities internal communication has become largely bilingual. Some department and faculty council meetings are even routinely held in English. Are such trends to be celebrated or deplored? Whether to honour our respective languages and cultures, to fight the elitist character of our universities or to preserve a smooth symbiosis with the surrounding society, should we endeavour to resist or even reverse the Anglicization of universities? Whether to boost the international status of our universities, to create greater continuity between teaching and research or to better equip our local students for today’s world, should we instead keep upgrading the place of English in all aspects of the life of our institutions of higher education? Organizing committee: J.P. Lambert (coordinator), E. De Keuleneer, H. Garmyn, P. Loobuyck, B. Pattyn, P. Van Parijs, D. Willems, J. Willems, D. Zwarthoed.